For information on the Austin A30 Seven, see Austin A30. For information on the Mini based Austin Seven, see Mini. For information on the 1909–11 Austin of a similar name, see Austin 7 hp. Many Austin 7s were rebuilt as "specials" after the Second World War, including the first race car built by Bruce McLaren, and the first Lotus, the Mark I. Edge convinced Austin to use a small four-cylinder engine. The original side valve engine design featured a capacity of 696cc (55mm x 77mm) giving a RAC rating of 7.2 hp, the cast cylinder block featured a detachable head and was mounted on an aluminium crankcase. The crankshaft used one roller and two ball bearings and the big-ends were splash lubricated. Edge also carried out the design of other mechanical components such as the three speed gearbox and clutch assembly. Austin was largely responsible for styling the Seven's design, which was reportedly influenced by the design of the Peugeot Quadrilette. The "A" frame chassis design was believed to have been influenced by the design of an American truck used in the Longbridge factory in the early 1920s. The design was completed in 1922 and three prototypes were constructed in a special area of the Longbridge factory, and announced to the public in July 1922. Austin had put a large amount of his own money into the design and patented many of its innovations in his own name. In return for his investment he was paid a royalty of two guineas (£2, 2s), (£2.10) on every car sold. Nearly 2,500 cars were made in the first year of production (1923), not as many as hoped, but within a few years the "big car in miniature" had wiped out the cyclecar industry and transformed the fortunes of the Austin Motor Co. By 1939 when production finally ended, 290,000 cars and vans had been made. The Austin 7 was considerably smaller than the Ford Model T. The wheelbase was only 6 ft 3 inches (1.905 m), and the track only 40 inches (1.016 m). Equally it was lighter – less than half the Ford's weight at 794 pounds (360 kg). The engine required for adequate performance was therefore equally reduced and the 747 cc sidevalve was quite capable with a modest 10 hp output. The chassis took the form of an "A" with the engine mounted between the channel sections at the narrow front end. The rear suspension was by quarter elliptic springs cantilevered from the rear of the chassis while at the front the beam axle had a centrally mounted half elliptic transverse spring. Early cars did not have any shock absorbers. Brakes were on all wheels but at first the front brakes were operated by the handbrake and the rear by the footbrake, becoming fully coupled in 1930. In late 1931 the chassis was lengthened by 6" with a corresponding increase in the rear track. Steering is by worm and wheel mechanism. The original 1922 four-cylinder Austin Seven engine had a bore of 2.125" (54mm) and stroke of 3" (76mm), giving a capacity of 696 cc and RAC rating of 7.2 hp. From March 1923 the bore was increased to 2.2" (56mm) giving 747 cc and 10.5 hp. The side-valve engine was composed of an aluminium crankcase, cast iron cylinder block and cast iron cylinder head. Cooling was by thermosiphon, without a water pump, and the dynamo was driven from the timing gears. The big end bearings were lubricated by jets from an oil gallery in the crankcase, the oil striking the crankshaft webs which were drilled accordingly. Originally the journal diameter was 1.125"; this was later increased to 1.3125". The three bearing engine (from 1936) used a white metal centre bearing. The splash-lubricated crankshaft (pressure fed on some sports models) at first ran in two bearings (two ball bearings at the front, roller at the back) changing to three in 1936. An electric starter was fitted from November 1923. The early cars used magneto ignition, but this was changed to coil in 1928. The 3-speed and reverse gearbox was integral with the engine, and had a variety of ratios depending on application. A four-speed gearbox was introduced in 1932 and in 1933 synchromesh was added to third and top ratios extending to second gear in 1934. The back axle was of spiral bevel type with ratios between 4.4:1 and 5.6:1. A short torque tube ran forward from the differential housing to a bearing and bracket on the rear axle cross member. Reliant used a derivative of the Austin Seven engine for their early three-wheelers, before developing an aluminium alloy engine (used as the replacement for the Austin Seven engine by the 750 Motor Club in their Formula 750 motor sport). Herbert Austin's son-in-law, Arthur Waite, soon began to achieve remarkable sporting successes beginning at Brooklands in March 1923 and the next month at Monza. Another driver, E C Gordon England, persuaded Sir Herbert to provide him with a racing 7. Waite and Lou Kings (chief tester) then experienced a run of failure brought about by inadequate engine lubrication for racing conditions. Meanwhile, Gordon England flushed with success from establishing six new class records at Brooklands, had built a special lightweight 2-seater body weighing just 20 lb (9.1 kg) and entered it in the 1100 cc class for the Junior Car Club 200 mile race at Brooklands in October 1923. There Gordon England finished in second place and during the race won another five class records. So two new sports models were offered in January 1924, the Sports and the Brooklands Super-sports. The Brooklands Super-sports was a replica of Gordon England's record-breaker. Each car was sold with a Brooklands certificate proving a speed of 80 miles 0 chains (128.75 km) per hour. By 1925 Gordon England held nineteen 750 cc class records. Until fabric bodies fell from fashion in the early 1930s the Gordon England Fabric "de luxe" Saloon remained in Austin's catalogue at a £20 (14%) premium over Austin's standard steel saloon. It was accompanied by their 2-seater Gordon England Cup Model. In 1927, William Lyons, co-founder of the Swallow Sidecar Company, saw the commercial potential of producing a re-bodied Austin 7. Buying a chassis from dealer Parkers of Bolton Lyons commissioned Swallow's talented employee, coachbuilder Cyril Holland, to produce a distinctive open tourer: the Austin Seven Swallow. Holland (1895- ) who joined Swallow in late 1926 had served his apprenticeship with Lanchester and would become chief body engineer. The height of saloon car fashion of the day was to have the back of the body fully rounded, this was called "dome" shaped. With its bright two-tone colour scheme and a style befitting more expensive cars of the time, together with its low cost (£175), the Swallow proved popular and was followed in 1928 by a saloon version: the Austin Seven Swallow Saloon. Approximately 3,500 bodies of various styles were produced up until 1932, when Lyons started making complete cars under the SS brand. Such was the demand for the Austin Seven Swallows that Lyons was forced to move in 1928 from Blackpool to new premises in Coventry. It was, in part, the success of the Swallows that laid the foundations of what was to become, by 1945, Jaguar Cars. Versions of the Austin 7 were made under licence by American Austin from 1930, Dixi (later bought by BMW) in Germany from 1927 and Rosengart in France from 1928. Austin 7s were also manufactured by Nissan (Datsun) but reports differ as to whether these were built under licence or were unlicensed copies. In addition, rolling chassis were exported to Australia to have locally made bodies attached. In the aftermath of World War I the Australian Government imposed a tariff on imported vehicles, with tax concessions applying to rolling chassis, as a stimulus to develop a sovereign motor vehicle industry. The chassis concession acted as a financial incentive for local coach-builders to import factory built rolling chassis, and fit uniquely Australian designed and built bodies, leading to the establishment of an Australian motor vehicle bodybuilding industry in the early 1920s. The largest and best known of these Australian coach-builders was Holden's Motor Body Builders. Holden built Australian-bodied Austin Seven tourer and roadster models from the mid 1920s. However, several smaller coach-builders built limited numbers of Australian-bodied Austin Seven sports models between 1924-34. Some examples of these Australian-bodied sports models are; the Standard Sports, built by Flood Motor Body Works, St Kilda Road, Melbourne; the Wasp built by William Green, Parramatta Road, Petersham, Sydney; the Moth built by Geo Sykes, Gordon Road, Chatswood, Sydney; the Comet built by Bill Conoulty, Sydney; and the Meteor. The Meteor was built by several coach-builders (Flood Motor Body Works, St Kilda Road, Melbourne; Jack Lonzar, Kent Town Adelaide; and A Robinson & Co., 181 Castlereagh St, Sydney), with individual variations to the common design. In 2007, during an episode of Top Gear, Jeremy Clarkson and James May studied a number of early car designs (including the Ford Model T and the De Dion-Bouton Model Q) and concluded that the Austin Seven was the first mass-market car to be fitted with a "conventional" control layout, as found on modern cars (although the earliest car they found to use this layout was a Cadillac Type 53 in 1916). Speedy Aluminium body. Pointed tail. The Ulster gained its name from a strong performance in the 1929 RAC Tourist Trophy held at the Ards circuit in County Down, where Archie Frazer-Nash finished third and S. V. Holbrook finished fourth. Arthur Waite won the 1928 100 Miles Road Race driving an Austin 7. ^ Baldwin, N. (1994). A-Z of Cars of the 1920s. Bay View Books. ISBN 1-870979-53-2. ^ a b c d Mills, Rinsey (1996). 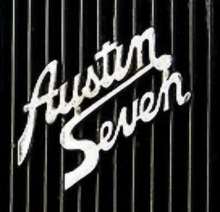 Original Austin Seven. Bay View Books. ISBN 1-870979-68-0. ^ "Classic Motor Monthly: The Super Accessories". Classicmotor.co.uk. 27 December 1998. Archived from the original on 21 June 2012. Retrieved 23 June 2012. ^ "The Austin Seven Special". Pasttimesproject.co.uk. Retrieved 23 June 2012. ^ "Austin 7 Special". Tanygraig.force9.co.uk. Retrieved 23 June 2012. ^ Robson, Graham (2006). A-Z British Cars 1945–1980. Herridge & Sons. ISBN 0-9541063-9-3. ^ Georgano, N. (2000). Beaulieu Encyclopedia of the Automobile. HMSO. ISBN 1-57958-293-1. ^ a b c d e f g Cheetham, Craig (2004). Vintage Cars - The Finest Prewar Automobiles. Rochester, United Kingdom: Grange Books. p. 33. ISBN 1840136359. ^ a b c Wyatt, R J (1981). The Austin 1905—1952. David & Charles, Newton Abbott. ISBN 0 7153 7948 8. ^ Display advertising—Austin. The Times, Tuesday, 20 Mar 1928; pg. xliv; Issue 44846. ^ Sedgwick, M. (1989). A–Z of Cars of the 1930s. Bay View Books. ISBN 1-870979-38-9. ^ "Jaguar History: Swallow Sidecar Company". Archived from the original on 30 June 2007. Retrieved 18 July 2007. Wikimedia Commons has media related to Austin 7. Wikimedia Commons has media related to Gordon England coachwork. Wikimedia Commons has media related to Swallow Sidecar. Austin Seven Owners Club A meeting place for owners of Austin Sevens or those interested in old cars in London and the Home Counties. The Austin 7 Clubs Association Details of the various A7 member clubs throughout the UK and the rest of the world. The Pre-War Austin 7 Club The largest club purely for the Austin Seven. A7 Components Spare parts for all models of Austin 7. Austin Seven Special Register The Register for Austin 7 based Specials.